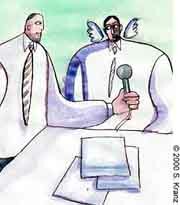 Host: Before we go on, Mr. Angel, lets back up a minute. Apparently, you angels had been consulted from the start about the creation of this first man. Angel: Sure, that's true. It's no secret, either. Take a look in the Genesis account, you'll see where The Boss, May His Name Be Sanctified, says, "Let us make Man!" That "us" is a reference to none other than us angels. Host: But why would He feel it necessary to consult with you and your colleagues? Angel: That's just what we wanted to know. And we told Him right off, we said, "Listen, Almighty Boss, the cosmos and everything within it is all Yours. You do with it as you see fit." But he wouldn't take that for an answer. He said if He would just go ahead without consulting his employees, from whom would Alexander of Macedonia or Empress Katerina or Bill Gates or others who model themselves after Him have to learn? Host: So what did you advise? Angel: First we did our research. We requested a complete technical feature glossy on this Adam character. Host: He gave that to you? Angel: All He had to say was that this creature was going to have even more intelligence than us. I can't hide the fact we were immediately skeptical. So we asked the Omniscient Creator, of Blessed Name, for a complete prognosis on this Adam-to-be and all his progeny for all generations. What exactly would he be doing with all this wisdom? Host: That must have been hard to sit through. Did He lay it all out? I mean, theft, avarice, homicide, warfare, genocide, sexual abuse, deforestation and environmental pollution, the public school system...? Host: The fact is, you gave approval and agreed to perform a job in which you actually had no confidence to begin with. Why? Angel: What were we supposed to do? Say, "Sorry Ultimate Boss and Master, we don't think it's a good idea"? Like I said: We had already told Him to go ahead and make His own decision. But no, He wanted us to debate the issue and present our findings. Host: Now, tell us about this debate. Angel: It didn't last too long. The whole account is in Midrash Breishit Rabbah. Basically, the Angels of Truth argued against and the Angels of Kindness argued for. Look, somebody had to argue for. The Angels of Truth argued quite convincingly that since The Almighty is a G‑d of Truth and Man is full of lies, he simply would not be compatible. Host: So how do you argue with that? Angel: They went a little further. They said that since Man will once in a while do some kind deeds, and G‑d is a Lover of Kindness, therefore there might still be a chance. The Angels of Truth were prepared to step all over that one, but they didn't get a chance. Before they knew what was up, they had been cast down to the earth where their vote doesn't count. So only the defense was left, who were shocked to find they had won a case they didn't really want to win. And then He went ahead and made Man before our disbelieving eyes. Host: Back to the creation scene now — because I know our audience is real excited to hear about that — you actually witnessed the creation of Adam first hand then? Host: But I thought Man was made in the image of G‑d? Doesn't it say that somewhere? Why are you shaking your head at me with such a pitiful look? Angel: You must be a human. It takes real thickness. Don't you realize: HE DOESN'T HAVE AN IMAGE. Angel: What it means is exactly as I've already told you. The image, i.e. design structure, that He used as the backbone for His entire creation — ten sefirot, etc. — He gave the soul of Man that image. I mean, it's a truly awesome piece of engineering. Angel: You don't appreciate the elegance of this design. Have you ever seen or heard or touched a masterpiece? When you get to the core of things you find the artist didn't just do it. He invested his entire being into his work. Well, that's what you get with the ten sefirot. True G‑dliness. Thats why you can call Him Wise, All-Knowing, Kind, Mighty, Compassionate, etc.... because He invested His Ultimate Oneness into those attributes in order to make a creation. Host: And that's what He put into Adam. Host: So He mentioned this soul into Adam. Angel: No, no, no. That's how He did everything else. With Adam, He really blew it. Host: Oh, so that's where it went wrong. Angel: No, that was the best part. He blew into his nostrils the Breath of Life. Get it? Host: Um, us humans are kind of thick. Angel: Here, take a deep breath. Now blow it all out at once, with all your strength. See how all your being is drained into that act? If it's deep enough, like when you suddenly sneeze, you actually go unconscious for a moment. It's not like just casually talking. Host: So that's another way of saying that G‑d invested His innermost into Adam. Angel: So to speak. That's what the Zohar says. I mean, you humans tend to take these things all too literally. As though we were talking about a Duncan Hines cake mix or something. That's why we don't generally go on public TV about them. But that's the basic idea. Host: So what went wrong? Angel: Look, our job was software. How were we supposed to know that the hardware was to be made from mud? We pleaded with The Almighty Engineer of All Things to find a more fitting encasement for such an ultimate being. He assured us that this was the finest material possible. Angel: I know what you're going to say. It's public knowledge that the human body is actually a physical metaphor for the human soul, fitting it in every facet like a glove. Angel: It's mud! You don't understand! You don't know what beauty is! You've never seen a spiritual body, like those of us angels — when we're not appearing on TV. So you think this is beauty! And instead it's stuck inside this gray meat patty processing data fed it by crude external perception devices that define everything in terms of measured, finite time and space! Host: You seem to be getting rather emotional about this issue. Angels are quite emotional, aren't they? Host: But if the software is so good, isn't that what counts? Angel: [blank stare] Perhaps you'd also like to run Windows 2000 on a 286? Or would you like to try ray tracing and 3D rendering on a Commodore 64? Angel: It's worse, much worse than that. Host: So how did you get it to work? Angel: Well, we had to create an operating system that could interface between them. We threw in a Vitalizing Soul to take care of running the basic body I/O stuff. Then an Animal Soul to deal with data processing, and for an intelligence component and interface directly to the Breath-of-Life G‑dly soul, we designed an Intellectual Soul — which actually has some elements of free choice and meta-consciousness. All as described in the Book of Intermediates. Look, it's a kludge. It ended up so complex, with all this multitasking going on in all different directions at once, that there are just so many bugs and things that can go wrong. Most of the time the Animal Soul just hogs all the processing time, and then the thing gets into such a mess... it's so, so limited... and He put a G‑dly soul inside... can you imagine? Host: What kind of mess are we talking about? So that's when we posted an official notice of litigation. We cited The Almighty Blessed Be He's original statement that this being was to contain even more wisdom than us. Since we had been employed for the design process, we felt that statement was a contractual obligation and what had now ensued was without legal justification. So, see? Really it was our compassion for Man's pathetic state that drove us to demand a justification of the act of his creation. That's when The Almighty suggested a contest — between us and Adam. Host: Now, let's get to this contest. Describe the scene for our audience. Angel: It was awesome. And it was exciting. We all crowded into this theater that had a device to project 3D views of physical beings into the spiritual realm for all to perceive. The most sublime intellects amongst us, I mean like the Angel Gabriel and the Angel Michael and all the Supernal Chariot fellows, they took the front rows. The rest of us stood in the back munching the popcorn in total awe — I mean there's just nothing us World of Formation guys, or even World of Primal Creation guys, can add to the super-intellects of those World of Emanation pros. There's just no comparison. But we wanted to watch. Host: And what did you see? Angel: Physical beings. And we had to give them names. Host: Like a matching game. Angel: That's right. The kind you give little kids in kindergarten, where you show them a page of animals and animal names and ask them to match the names with the animals. That's what it was. Host: And for this you needed the Angel Michael? Angel: Don't get sassy, now. You've got to remember, this was the first time in cosmic history anything had been named. Those cutesy animals down there in the physical Garden of Eden, all of them were fresh off the production lines. Angel: NO! NO! NO! What do you think we are — Mattel Toys or something?! We had to MATCH them with names. The names already existed, just that they had never been called these names. That's what we had to do. Host: But how could names exist if nobody had ever called them? Angel: Such a shame. You know, your great-grandfather, Adam, he knew all this stuff. I guess it just didn't filter down to you — what can you expect with all that OS noise, physical device distortion and all? Anyway, we have a beautiful 3D multimedia show ready to run that will make the whole thing clear. Angel: Sure, just put these goggles over your eyes. Now bring the phones down snuggly over your ears. Here, let me place this device over your heart.. Host: Is that also the purpose of those electrodes poking out of the helmet into my brain? Angel: The only true model is the real thing itself. This device allows you a lucid view of reality. Host: If I'm supposed to see reality, then what are you doing altering my mind? Angel: At present, your consciousness is highly limited. It utilizes a filter that blocks out the objective reality for a more palatable, subjective one. Not really your fault — it's just that you are so encumbered by space/time parameters, you only see that which relates to space and time in their most quantifiable states. Couple that with your egocentric interpretive functions and your reality is way out of whack. Now, for a moment, you're going to see raw, lucid reality as the prophets see it at the time of prophecy, or other great tzaddikim at their most sublime moments. Something approaching what the Children of Israel experienced when, at the ultimate multimedia show at Mount Sinai, they saw the sounds and heard the sights. Host: Will I become a prophet this way? Do I get to see next year's stock market reports? Angel: Due to the minimal amount of briefing and preparation you've had, we'll be glad if you survive a few nanos and remain capable of producing intelligible speech. Think of it as similar to running all the turbo-electric power of Niagara Falls through a penlight. If you do retain your faculty of speech, however, you'll describe to our audience the entire experience. You will retain intellectual property rights over your description and be entitled to publish in major newspapers and journals internationally, as well as appear on Oprah. Host: I'll be glad to sign, right after a word from our sponsor, and then well be returning with part two of... The Adam Files! Host: Here we are back at the Cyberspace Show, discussing the Adam Files in an exclusive interview with that senior official, Angel aob57648-3e version 6.2 . When we last left you, I was about to don a mind-altering device in order to view the backstage reality behind our reality. Due to concerns of the TV hosts' union insurance agents and the failure of our lawyers to find an agreement to satisfy all parties, that plan has been dropped. Instead, Mr. Angel here has agreed to provide us a reasonable simulation, utilizing some amazing technology specially licensed from Heaven Technologies, Inc., exclusively for our show. Mr. Angel, explain to our audience just what is this device. Angel: Here we have a miniature creation device. It utilizes ten coordinated light sources that project a total of twenty-two varieties of energy types that combine in about 22-to-the-23rd-power combinations to form all types of objects that comprise an entire world and all its history. Host: OK, so let's try it. Host: Hey that's neat! Sort of a 3D-hologram effect! There are little animals and people walking around in a very realistic environment. I can even see the vegetation growing as we talk! Boy, where do you store the mega-data for all those images? Angel: They're not just images. They are kinetic-tactile objects. Little Guy: Hey, you up there! Pick on someone your own size! Host: Wow! They're interactive, too! Angel: Don't get abusive, now. They have feelings and intelligence and even consciousness as well. Just ask one of them and you'll see. Host: Hey, you! Do you have consciousness? Little Guy: I'm not sure. Let me ask Joe here. Joe, do we have consciousness? Joe: Consciousness? You still believe in that stuff? I told you before: If you can't see it, touch it or hear it, it doesn't exist. All that's up there is gray matter and physiological behavior-response! No consciousness. Little Guy: Joe says we don't have consciousness of our existence. Just gray matter. Joe: Hey! Who are you talking to? Joe: How many times have I told you? There are no giant beings in outer space! Little Guy: Hey, Mr. Giant? Sorry, but I'm going to have to stop talking to you. Joe says you don't exist either. And he's a scientist, so he should know. Host: Mr. Angel, this is impossible! How can a couple of light sources project tactile, interactive objects that have all the qualities of us human beings? Angel: Oh, this is only a miniature simulation. The one that makes you and your world is actually larger than this. Also, this one simply runs within the pre-existing time and space parameters of your world. The real thing inits those ex-nihilo as well. Host: Awesome! So, lets get into the technology behind this wonderful device. In very simple terms, how does it work? Angel: Sure, well it's basic Kabbalah stuff, like you read about in the Book of Formation, etc. Like I said before, there are 22 forms of energy that start out in ten express statements. They then branch out through various algorithms to make up every possible configuration of 22. Each configuration becomes an enlivening force for a particular object that is brought into being through that enlivening force. For example, see those miniature waves coming into the miniature seashore in our miniature world here? The ocean has a configuration of forces that creates it, waves have another one, and each formation of a wave at each point on its journey to the shore has a distinct configuration of some set of the 22 forces to create it. Host: Twenty-two—now thats an interesting number. Does that have any relation to the 22 letters of the Hebrew alphabet? Angel: Now you're getting on the ball. In fact, they are the original 22 letters. The Hebrew letters you use in reading, writing and in speech are the most direct physical manifestations of these 22 energy forces. Their spoken sound and their written form are reflections of the particular characteristics of each letter. Angel: ...and that makes 22 articulations of Divine Energy. Host: Awesome! So the energy-combinations of those 22 basic building blocks are like words! Angel: Precisely. And 22 letters make a lot of words. All the two-letter words, the three-letter words — all the way up to 22 letter words, and some beyond. Angel: At least 165,251,092,644,282,265,800,000,000,000,000 to be precise. Enough for every subatomic particle in this universe many times over. Host: But how do these words create tangible objects? Angel: It's sort of like how your own words work. After all, you are made in the Divine Image, remember? Host: We went through that in the last installment. Angel: So, say you have something bothering you deep inside, but you don't know what it is. So you go for a walk and words come into your mind expressing what this thing in your heart is. And then you speak it over with someone else. See? Your words take a numinous, simple feeling and transform it into tangible expressions that you and others can relate to and appreciate. Your words are a reflection of how the Divine words work, except they work with infinitely more creativity — in fact, they create existence out of absolute nothingness. First there's an absolute, indefinable void. Then there are ten harmonious sefirot — something like the Supernal mind and heart. And then all that was nothingness before becomes tangible creations through the medium of the ten sayings by which the world was made, with 22 Divine letters and the words they form. Host: Well, you angels could do it. Listen, we're talking major, major stuff here. I can see the ads now: Create your own worlds! Play G‑d in the comfort of your own living room! Angel: There is a higher force than venture capital. There's Him. Host: Don't worry about him. There are antitrust laws. We'll copyright the look and feel so reverse engineering won't help. Besides, we'll sell him non-voting shares and let him talk to all our stockholders over a big screen. Angel: Not him. I meant Him. Host: Oh, that Him. Can't do it without Him? Angel: That's the whole secret behind the creation ex nihilo bit. You see, everything else is a something that has another something from where it comes. Whatever those somethings could create would still not be something from nothing. But He Himself has no source, so He is not a something, really, at all. He just is. Therefore, He alone can create a tangible something just out of nowhere. See The Holy Epistle (Tanya, Book 4), chapter 20. Angel: Well, put it this way. If He gave you the power to create, it wouldn't be creating out of nothing, would it? Whatever you would create would have a source, namely the power within you to create. But with Him, blessed be He, it's not that way. There's no power to create, no potential world. Nothing. Just an ultimately simple Thereness. And that's the power behind those Divine, creative words — He is there within them. Host: Then where do you guys fit into this whole system? Angel: Glad you asked that, because that's crucial to understand for a proper understanding of the Adam vs. Angels conflict. We don't generate this system. We're just part of it. We get created by combinations of the 22 letter-forces just as you do. Then we have some management positions within it. Host: So what makes you a refined spiritual being and me a coarse, physical object? Angel: It's a quality issue. You see, there are words and there are words. There are the words you speak to other people, and there are the far richer, luminous words that you hear inside your own mind. The words that create us are more of the latter sort. Now, ask your question again. Host: Hey, little guy, do you have consciousness? Little Guy: There is only the Higher Consciousness of Supernal Being. What you see is a mere reflection of that awesome light. And let us praise the Source [breaks into ethereal singing]. Hallelukah! Angel: Or we could turn it down ever so slightly, like this, thereby coarsening the quality of the vitality that enters the system. This will also conceal the origin of the beings from them, to the point that they will not recognize that anything at all exists outside of their own little realm. Host: Sounds like that's where that Joe guy was at already. Angel: Joe was an angel compared to where those two are at now. Go ahead. Try getting into a conversation with them. Little Guy: Cut the excuses and get to the point. Host: Do you have consciousness? Little Guy: Depends. How bad you need it and how much you willing to pay for it? Little Guy: Just tell me who the market is and what sort of volume sales you expect to make. Host: Angel! He's making fun of me! Angel: I better turn that function back up before this guy gets you beeped off the air. Host: So, back to our subject, you're telling me that you and I and all of us and all this about us is nothing more than G‑d thinking and speaking, thereby creating this Divine flow of energy that makes us happen. And that's what it means, "He spoke and it was!" Host: And once He's spoken His words, well, here we are. Angel: In a limited way. Little Guy: No! Don't do that! Joe, they're threatening to unplug our world! We'll cease to exist in a flash! Joe: There you go with your doomsday stuff again. Host: Hey, little guy! Where did Joe go? Little Guy: Joe? Who's Joe? Host: How come he doesn't remember Joe? Angel: The energy-combination that creates Joe is beyond the time-space parameters of the little guy's world. So when it is removed, Joe's past is gone as well. In that world, Joe now never existed. Host: Couldn't you just play around a little with Joe's particular configuration so he gets a little more sense in his head? Angel: Sure. That's what you call making a miracle. You just temporarily change around a few forces and allow things to work differently for a while. You'll find allusions to the mechanics of it even in the Talmud. But the Boss likes to avoid that whenever possible, saving it for only special occasions. He likes the natural order better, since it's much more elegant. Of course, tzaddikim play that game frequently. That's how they heal the sick, make golems, cause vinegar to burn like oil — all that stuff. Host: So you can remove stuff, you can modify it — how about adding on? Can you introduce new elements into this environment without upsetting the system? Host: Hold it! This is heavier then damming the Yangtze! What about the environmental impact study? Do you know what kind of fluff this is going to get you from the Green Lobby? Angel: Everything's under control. We've got unlimited teams of ecology balancing angels built into the system to manage all the necessary adjustments. As a matter of fact, nobody within the system will notice a thing out of place! Angel: Go ahead and ask. I even put Joe back so you can get a scientific perspective. Joe: [shaking his head, mumbling to himself] Maybe I've just been thinking too hard. It's those voices again. Host: I mean, hey little guy! Where did those mountains come from? Little Guy: Mountains? Mountains don't come from anywhere! They're just there! Host: Well, they had to get there somehow! Little Guy: Hmm, I guess you're right. I'll ask Joe the scientist. Joe, how did those mountains get there. Joe: Those? Oh, that's the Galapuskian Range. They formed in the volcanic upheaval of the Epidermical Era which ended 150 million years ago. Host: Listen, guy, tell Joe he's off his rocker! Those mountains weren't even there yesterday! They appeared just now, along with those trees you're standing next to. Host: Sure. Surprise, surprise! Didn't notice those trees you're standing next to? So when did those get there, eh? Little Guy: Well, I can remember climbing that big maple as a youngster. And the other whatever-you-call-them big trees, well, they look pretty old to me. Joe, any idea how old these trees are? Joe: Simple! We just count the rings on this stump, which appears to be of the same age... looks like about 140 years old. Apparently, however, not virgin growth. Host: It's not true! That stump was just created this very moment! And so were all those other ones, and even the mountain range over there! You guys are making this all up! Little Guy: You know, Joe. I've decided you were right all along about those voices and talking to super-beings out in the sky. Host: I've lost credibility, just by saying the truth. Host: But, what's with their memories? Did you adjust those too? Angel: Their memories are perfectly intact. That small being did climb that maple as a child. When we created the maple, we created its entire past, and that event was included in it. Angel: Well, that's not within their living memory range or recorded history. But if their world had actually developed on its own within the same parameters and conditions as it has now, their estimate wouldn't be so far off. Look, that's not the point. The point is that now you can see how everything within this little world before you is nothing more than manifestations of the energy configurations put into it through this device. Even its past, its sense of time and space and consciousness. And that should give you an inkling of how your world here is sustained in a similar fashion. Host: Wow! So that's the real reality! But we don't see all this! Why can't we see these words of energy configurations that are constantly creating us at every moment? Angel: Oh, well that's a user-interface issue. The Blessed Creator in His Infinite wisdom wanted to hide all the engineering from the end users. A transparent interface just wouldn't have allowed any room for free choice. You wouldn't feel like you were in a real world. Host: OK, so you had to place something between the user and the raw code — but couldn't He have made it a little more user friendly? Angel: Look, I admit it's not exactly intuitive as shipped. You need a manual to figure out what to do and what not to, and even that wasn't delivered for the first 2448 years of existence. But it could have been worse. I mean, He could have hired some hick company in Redmond, WA to design the user interface. Angel: And things eventually work out. It just takes some fine tuning. Listen, very soon there's going to be a whole new reworking of the user interface. Things are going to be 100% intuitive. The whole system will become transparent. Downright luminous. Host: Any inside rumors on the shipping date? Angel: It shipped already. With the manual you got over 3300 years ago. You've just been installing it ever since. Host: You mean all those 613+ instructions are for fine tuning the Creation? Angel: On the ball again. You must have been reading those Sinai Files. Host: Talking about the Sinai fiasco, we're going to be getting into an even earlier fiasco, this time centering around a contest between the ministering angels and the primal Man. The stakes were as high as they can be and the competition even higher. Mr. Angel here has brought an under-the-table video that reveals all. We'll be showing that to our audience with a running commentary from the experts, just as soon as we get back from our sponsor. Host: Welcome back to the Cyberspace Show. [VIDEO] The upholstery in the theatre is in good shape, as would be expected considering that the world of the angels had only been created in the last few days. But it is crowded, and it is intense. Standing arrangements (angels don't sit) are by ethereal plane, this being a cross-boundary, inter-reality theater. In the highest realm of existence stand the Supreme Angels of Kindness, Judgment and Compassion. Oblivious to the successively lower realms beneath them, they stare intently into the projection capsule, focusing all their massive, perfect intellect onto the case at hand. Angel Gabriel: Basic element is mud. That's a composite of all four basic elements of fire, air, water and earth as they exist in the lowly physical realm, with a preponderance of the latter two. Gabriel: ...and of course, fire and air in their totally non-physical, abstract form. Michael: Now that takes care of its substance. What about its form? We've got to have some analysis on that. Gabriel: It is entirely quantifiable within the measurements of three dimensional space, within which it excludes the possibility of any other physical form. It also leads a single point existence on a linear path of time. Raphael: You mean, it only exists at one single point in time at any given moment? Gabriel: And in only one perfectly defined space — with absolute exclusivity on that space as well. Physical objects are not able to share the same space. Raphael: Wow! I never imagined the Light could descend that low, into such severe limitation. Gabriel: This is the ultimate limitation. Raphael: So then, how could they exist if there is no room for harmony or shared data? Existence is a product of life-flow, and that could only be in something that is capable of surrendering some of its self-ness. Michael: I think you've hit on something, Raphael. That is definite evidence that there is life within this being. But where, and — more crucial to our task — what?? Michael: And I can detect the flow descending into it. I believe it is emanating, initially at least, from the animal to the left on the Divine Chariot. Raphael: Then that angel should be able to name this creature! Michael: I have a better way. Gabriel, look up the combination of divine powers creating the angel to the extreme left of the Divine Chariot. Gabriel: That reads, Shin, Vav, Resh. ShOR. Host: That's it! They've done it! Shor! — that's Hebrew for ox! Holy cow! They've found the source of the animal up above and figured out its name that way! Angel: Hold on — it's not so simple. Figuring out is one thing. Calling it a name is another. Angel: Wait and see what happens next. Raphael: The ShOR Angel is all lit up now! Looks like a hyper-conductive conduit of energy has been led through it! Michael: That's just the effect of Gabriel calling its name. He's brought it into transparent interface with its source. It's bonded now — at least temporarily. So its source is shining through at full power. Gabriel: Now if we could only achieve that with this mud-being here. That's the challenge. Raphael: Sorry. Don't see any luminance happening there. Just a dumb four-legged chunk of meat staring at us while chewing pre-chewed grass. Host: I don't get it. They've got the name and it works. What's the problem? Give them their little gold figurine and let them go home! Angel: Of course you don't get it. They've got something you dont have. Host: Fluffy wings and flashy halos? Angel: Intellectual integrity. They can't call it a name until they can actually see that element of spirituality within it on its own level. Right now, they're calling it a name doesn't accomplish anything. They've got to call the name into it because they really see it there. That way they will actually connect it to its source. Michael: We're not going to be able to achieve anything with that thing from here. We're too elevated. We need to contact one of the lower realm angels with the data and have him do it. Raphael: Oh, no! We can't do that! I tried it just yesterday. I appeared to this lower-realm being who receives his energy through me. He looked up and thought, Wow. This must be some sort of weird mirror. That looks like an exaggerated reflection of me, in qualitatively expanded terms. I had to tell him the truth, that no, just the opposite, he's just a reflection of me, lacking dimensions 25 and 26 and qualitatively totally superfluous at relatively zero energy. Gabriel: What happened to him when you did that? Michael: I don't think I want to hear. Raphael: He was just gone. He shifted into ecstasy mode and the energy levels were just too high and... look, I didn't know... the world's just been created after all... how could I have known the poor little guy was without overload protection? Gabriel: What a way to go. Michael: OK, so angels are not upwardly mobile without serious overload consequences. But can they move downward? Gabriel: Just who are you planning to send down there? Michael: ...he should be able to draw it into himself. You might call it auto-connectivity. Gabriel: Of course, we could always give him some prompts. Sounds interesting. Michael: We better look at the compensation clause in his contract. Gabriel, anything about terminal materialization in there? Gabriel: It's not necessary. I've figured out a way we can send him down to the most absolutely physical realm and yo-yo him back up immediately once his mission is accomplished. Gabriel: Apparently, the Boss, Blessed Be He, left a door open for that sort of thing, meant for future cases such as visiting Abraham, rescuing Abraham's nephew, helping Ethel Goldberg's husband keep his job despite himself, and similar such cases. Raphael: And just who is He planning to use on those missions? Gabriel: You don't want to know. Raphael: First of all, it does make a difference. Secondly, if it's His sublime mission, then the descending beings will obviously remain intimately bonded throughout their journey. But who says we can insure that on our little escapade? Michael: My dear colleagues, we all understand the risks involved in this experiment. But on the other hand, we also are well aware of the implications if we fail. Raphael: Michael, winning isn't everything. Michael: Winning is the least of my concerns, Raphael. The earthly beings must be connected to their source, or else the whole of creation will remain a futile exercise, terminated before it even has a chance to achieve maturation. Our continued existence depends on a smooth and constant circuitry of energy connecting the highest with the lowest and then moving back up reciprocally. Gabriel: The current I am aware of is DC — a direct, unilateral current from Above to Below. I perceive it as pulsating in an on/off modulation. We become aware of the supernal void from which we extend, then, as we surrender our state of being to that all-transcendent reality, we are renewed with the Divine Will that we exist. Which brings us once again back to the awareness of the Higher State, and so on at every nanosecond. Raphael: Gabriel, hold on the meditations! You just burned up 10,000 hosts of lower realm angels! I was only able to re-corporealize them through an extended turbo-compassion flow. Gabriel: Sorry, Raphael, but that's all just part of the dynamic. You're going to have to get used to working this way, 'cause that's what we're stuck with for the next 6,000 years. Michael: Gabriel, you are certainly correct that the primary current is DC. Nevertheless, there is a secondary, yet more important current — namely, the Reciprocal Light. It reflects the very purpose of creation as well as the Absolute Oneness of the Supreme Being, as it implies that there is nothing outside of His Oneness, even to the very lowest of worlds. Gabriel: The DC stuff isn't enough? Michael: The flow that comes directly from Above is rationed and highly limited. What comes from below brings new, extra and transcendent light into our hollow. Also, the DC energy can only endure temporarily without some sort of flow being initiated from below. Raphael: So what creates the AC current? Gabriel: I believe we'll have a demo of that right now. Gabriel, zoom that camera on the Adam being, right away. [Up in the heavens, all is shaken as the angels light up in neon colors and a tremendous surge of energy rockets through them on its upward path, and then again, even more, as the energy pours back down in torrents. Raphael: [still recovering] Michael, that was wild! Gabriel: Michael, you still with us? Raphael: We never had anything like that energy before. It was an entirely new sensation. How can we get more? Where does it come from? Michael: It originates from the base, material world. There is infinite light hidden there, far beyond anything that can descend directly from Above. Gabriel: Hold it! If they have an infinite light, then why are they so base and material? Michael: I know it sounds counter-intuitive, but you'll just have to trust me on that one. In order to generate tactile-kinetic physical material out of our spiritual reality, the Infinite Light had to be engaged in full force. It's there, but in ultimate concealment. Gabriel: Sounds like another of those highest-things-are-revealed-in-the-lowest paradigms. Michael: You got it. Only the most ultimately infinite could create the most ultimately finite. Generating more and more spiritual worlds — well, any old divine light can do tetra-realms of those. But to create a tangible clump of dirt out of spiritual energy, you need the Absolutely Infinite to pull that one off. Raphael: I don't see any infinite light down there. There's no expression of any source of anything at all. Up here, everything is just bubbling with expression of its source in a higher realm. Down there, everything just seems to say, "Here I am and here I was, and that's what I am." Michael: That's precisely it! That is the Ultimate Revelation of the Essence of the Infinite Light! Michael: Yes! Because that little script that they seem to say — that's really the voice of the Essence of Being, that says, "Here I am and Here I was, and I am that which I will be." Only that here we can only imagine such things. There it's a tangible first-hand experience! Gabriel: So they've got this Absolutely Infinite Light down in that dark, dingy material realm, and we can't tap into it without them. Michael: Now you're beginning to see the urgency of the situation. Time is running out. They need to be connected to their source up here to continue their existence. At present, they endure on a sort of initial subscriber free plan. But that can't last more than a few hours more. If we don't connect them soon, by giving them names according to their supernal connections up here, they'll just fade back into the void. Raphael: And then, never again any of that fabulous sensation. Gabriel: Nothing but the same, regulated ration of divine flow every day for an eternity. Michael: It might not be even that. The Boss may just describe to scrap the whole thing. What's the point, with no excitement or novelty involved? Raphael: Alright! Alright! I've heard enough! Send the Supernal Ox down! Just don't let me watch what happens to him! Gabriel: I'm making the adjustments right now — just look in the projection capsule display. He's morphing down and down through each of the progressively lower spiritual realms. Passing through Creation Realms, now to the realms of Formation, into the worlds of Action. OK, now he'll be making that quantum leap into physicality. I'll need to enter the secret code granted for this operation. Michael: Gevald! Gabe, you did it! He looks just like the original beast in question! Raphael: Don't tell me! Don't make me look! Michael: And he's standing right next to him! Now he just has to name the thing! Gabriel: We'll open up lines of communication now. ShOR! Can you read me, ShOR?! Gabriel: I'll amplify the signal. Obviously, the descent has dulled his signal perceptions further than I had estimated. ShOR! STOP MUNCHING THE GREEN STUFF AND CONFIRM RECEIPT OF SIGNAL!!! Gabriel: That seems to be the sign he's received the signal. Now if we can remind him of his mission. ShOR! LOOK AT THE BEAST TO YOUR LEFT AND CALL IT BY NAME!!! Gabriel: Yes! He's got the message! He's pondering the other ox! Gabriel: ...And he's realized that he and that other beast share a commonality. Now, certainly, he'll be able to draw into it his own name directly from the Supernal Chariot of the heavenly spheres! ShOR! NAME IT NOW! ShOR: MOOOO! [Clunks over to the other ox, pushes him aside and munches on his grass.] GRUNT. Gabriel: Yes, that's the problem, I think he's descended too far. He's lost the capacity for coherent speech. Can't name anything without that. Raphael: No wonder he's experiencing such frustration and anxiety! Can't you have some mercy on the poor creature and allow it to retain some intelligent and communicative features while descending into the physical realm? Gabriel: OK, here are some minor adjustments. Now this beast-angel will be capable of speech and conscious thought. Let's play that again. ShOR! WHAT IS THE NAME OF THAT OX YOU JUST SHOVED INTO THE DITCH??!! ShOR: [Looks into ditch, ponders, then answers:] Subdued competitor. Can I get back to the green stuff now? Gabriel: That's not a Name! Thats an ego-relational designation! Raphael: Yes. He's become entirely ego-centered. It's so pitiful. You must rescue him fast! Michael: Gabe, Raphael's right. The whole thing is hopeless. This little experiment we've done has only gone to prove that which we should have known all along. It just can't be done. Gabriel: Of course it can't be done. It's an auto-conflicting task! It's downright recursive, thats what it is! Gabriel: Because you can't descend below and remain above at the same time! And you can't be a something 100%, like they are down there, and get inside something else at the same time! And — most important — you can't look at something physical and see anything spiritual about it all at once! And all those three things are precisely what we are demanding this ox to do! Michael: Raphael, look at the evidence. When the ShOR from the Supernal Chariot descended below, did he retain any spiritual qualities? No, he became exactly where we sent him to — physical. He couldn't remain above at the same time as going below. Of course not — it doesn't make any sense! Gabriel: And when he looked at the other beast, he couldn't see it for what it was — only how it relates to him. He couldn't be himself and get out of himself all at once. I mean, it's just ridiculous. How could we have imagined that to begin with? Michael: And this preposterous idea of being able to perceive spiritual energy within a physical being — well, you obviously can't see both at once! They're so, just — contradictory! Gabriel: You mean, we've lost? Raphael: Hold on! Which experiment do you mean? Gabriel: Are you still banking on that? But we just explained that it's totally impossible? Raphael: But it must be so! The Boss set up this match, didn't He? Michael: But Gabriel and I just finished explaining to you that it's impossible. Gabriel: Yeah, he'll probably just look at it and call it hamburgers or some such ego-relational designation. Raphael: But, maybe we should just give him a chance? Gabriel: Chance? What's the point of chance? If you know something just isn't, then it isn't, right? I mean, we are intellectual beings up here. There aren't any greater intellects around. And our logic says it just can't be. Raphael: Just give him a try! Just to be fair! Who knows? Maybe he can do it! Michael: Raphael, listen to common sense. For any creature to be able to do such a thing, he would have to be full of such contradictory elements as to oppose the basic laws of logic themselves. Michael, Gabriel & Raphael: WHAT??!! Adam: [Pleasantly] Yes, I think it would be nice to call you ShOR. Adam: And now, about myself, I suppose my Creator wishes that I should name myself too. So I will call myself Adam. Adam: Because I was formed from the earth, which is called adama. Voice from Heaven: And also, Adam, because you are similar (domeh) to the Infinite Light Above, which knows no boundaries. Yes, you were formed from the earth, but your soul is of the essence of G‑d, and in you the two are fused. You — unlike the angels — can transverse the boundaries that separate soul from body, spirit from matter, heaven from earth. You alone can look at a physical beast and see spiritual life and beauty. You alone can make this world of yours a place where I am revealed. And what, then, shall you call Me? Adam: [Scratching his head and pondering:] You are Who You Are and What You Are. You are beyond all names! Voice: But nevertheless, give Me a name that my creatures should call upon Me, and they shall be bonded to Me from their own subjective experience as well. And then I shall dwell in this world I have made. Adam: Very well, then I shall name You. You it is proper to call A-do-nai, because You are the Master (Adon) over all Your creations. How Old is the Universe According to Judaism? 1. when you introduce michael, gabriel & raphael you briefly mention their connection to chesed, gevurah and tiferes (Kindness, Judgment and Compassion). do they, in fact, correspond to these midos? What is the source(s) for this? gavriel is the only one whose name clearly matches one of the midos, gevurah; do the others' names also match their midos? 2. why do you say the ox was made of mud? I thought all of creation was made through speech, except for Adam, who was specifically made of mud. 1. Yes, those are how these angels are aligned in all kabbalistic texts I know of. 2. See Genesis 1:24: God said, “Let the earth bring forth every kind of living creature: cattle, creeping things, and wild beasts of every kind.” And it was so. Tzvi Tzvi, this is just like you. WOW This is an extreme expression of unbelievable creativity, in my opinion. I intend to reread this, extremely slowly, over a couple of hours, and take in the textual wealth being imparted. The inspiration and level of intelligence required to create this, leaves me speechless. I have not read any text, even remotely ressembling this one, in an extremely long time. Re one part of your story This is a terrific story; I believe I understand enough of it to make such a statement. But there's one thing I keep going back to. Your "Take a look in the Genesis account, you'll see where The Boss, May His Name Be Sanctified, says, 'Let us make Man!' That 'us' is a reference to none other than us angels..."
But, in Genesis, it doesn't say that (that the us = the angels). I'm sure this is something you've heard over and over, but you yourself wrote in another publication that one should stay away from that "I have heard that already." I personally hope that the 'us' does = the angels; it's something I want - even need to believe. But I should not ever say that something is true just because of want and need. How can you be so sure that G-d really DID consult with His angels?